Many areas of a city has a specific role to play within the community as a whole and those that live and work in these areas are proud of its success and notoriety such as with a design district or arts district. AGMedia has created many neighborhood identification light pole banners to announce to visitors and residents alike what the area is known for. 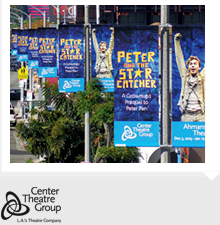 In fact for over two decades AGMedia has been the preferred provider of outdoor advertising for museum exhibitions, civic announcements, non-profit events and cultural happenings in major cities along the west coast. 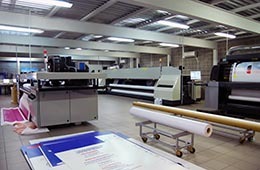 Because banner advertising stays in people’s minds without boring or annoying them, unlike some broadcast marketing, where commercials grow old soon after being aired, each time people see your banner, your community’s message is reinforced. Light pole banners for neighbourhood identification programs are by far the best way to attract the attention of the community and visitors. Los Angeles is home to more than 13 million people and is the second largest metropolitan region in the USA. 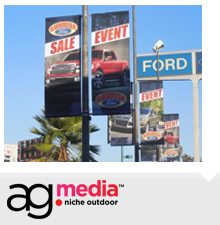 AGMedia dominates Los Angeles, San Francisco and other west coast cities with prime city light pole banner sites. It is almost impossible to drive down any major street in these cities and not see banners that were produced and installed by AGMedia. Using light pole banners for neighborhood identification programs pose by far the best way to offer the public an invitation – as far as the eye can see. 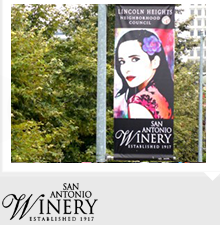 Light pole banners are a dynamic form of outdoor advertising that can create a memorable impression. 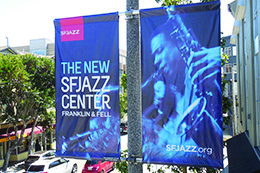 Used by cities, towns, colleges, universities, and organizations, lining your Main Street, downtown shopping district, shopping center, college campus, or office park – light pole banners are distinctive, inviting, and unforgettable. As a means to spread a consistent message to the masses they capture the attention of drivers and pedestrians alike. They can bring a cohesiveness to walk-about shopping areas or neighborhoods, dressing up the streets with eye-catching displays and graphics that practically jump off the pole. 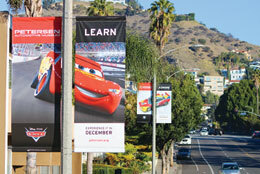 How can AGMedia light pole banners help your neighborhood identification programe?